Flamingo House’ is the latest addition to the Colombo’s posh restaurant chain. It is as suggested by the name itself, is quite distinctive and stands out from the rest of the places. Probably because of its unconventional and distinct style, the restaurant has become much popular within a short period of time. The food is conflicting and different but appealing. It is not definitely not fusion but of its own style. 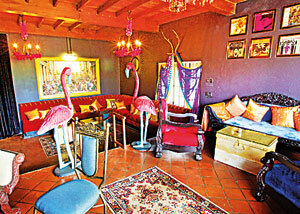 ‘Flamingo House’, located at Horton Place, Colombo 7, just adjoining the famous ‘Gerard Mendis Chocolatier’. 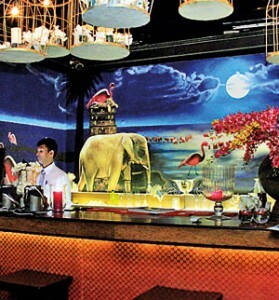 This is arguably one of the craziest, most striving restaurants in Colombo for all out of box thinkers. Natalie Jayasuriya, who is one of the co-founders of Flamingo House, stated ‘it’s a modernized inspirational work of art and it is up to the person looking at it to derive what they want from it’. ‘An artistically chaotic and pleasantly eccentric, expressive space that narrates an enthralling fable of profound love’; the simplest definition for the imaginative space dubbed the ‘Flamingo House’ she added. Ingeniously designed to entice and satisfy all senses, the venue is an eclectically driven dining and drinking space created with the intent of transforming the local dining spectrum. 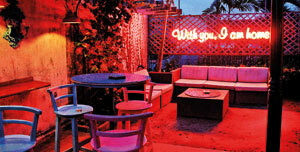 The Flamingo House spans three floors; the Flamingo House Restaurant, the Love Bar, and Private Lounge area, each level opposing conventional ideals and brimming with imaginative splendour. Decorated with chic interior of deep velvets, and bold colours accompanied by curious pieces of art, extravagant accents and antiquities the venue is entirely a work of art that celebrates the beauty in harmoniously entwining seemingly incompatible diverse elements; much like the forbidden love of Sir Alfred Clark and Satyavati, the tale that is the heart of Flamingo House. The restaurant has been open for just under a month now, but the service we experienced was nothing short of excellent, ranging from the waiter’s understanding of the menu to the quick service times. From the moment a guest enters the Flamingo House, the atmosphere sets in his mind to feel like he walked into a land of Pink Flamingos and so many other lands all settled in one location. The restaurant is designed according to the love story of Sir Alfred Clark and Sri Lankan village lass Satyavati written by Andre Estafan. The theme of the story can find everywhere in the restaurant. 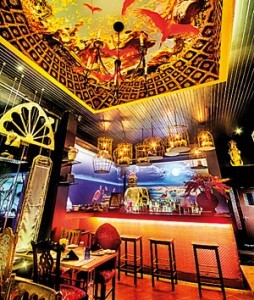 On the ceilings, the walls, the table mats and even in the cuisine that on order. Then there is the Ruby Room which portrays large pictures of a Satyavati and her father Murghan, which is perfect for private gatherings. Love Bar is at the top level. This place is full of stuff that is antique, made to look antique and truly funky to admire. Pink is yet again the theme up here. ‘The place all in all can accommodate around 60 pax downstairs and around 100 (standing) upstairs. Another floor is coming up which will be a private lounge and corporate functions. We have already got many private functions and are getting lot of inquires for private giga and parties’ said Natalie. The dishes come from Indian, Chinese, Singaporean, basically all neighbouring Asian cuisine with a dash or mix up of European. ‘But they are not fusion cooking. I call it blending the East and West. From Starters, Mains, Desserts to even Canapes there is a great choice and difference. Our menu is quite vast and we have a good variation from our general stakes. We talk to our guests a lot and we try to find out what they like and what they are looking for’ she added. Starters there is Lankini which is basically Kiri Bath but smaller and more cutlet shaped. This original dish from Chef Nero is actually a crispy milk rice cutlet stuffed with fish ambul thiyal on a bed of creamy coconut lentil curry and a homemade lunu sambol. Traditional Fondue which is a bubbly Swiss cheese flavoured with white wine and kirsch served with cubed bread. They also have chocolate fondue with fresh fruit – a treat not to be missed out on. 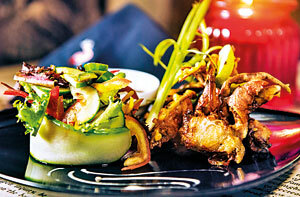 Some of the other starters are – Galle Face Green Isso Wade, The Flamingo Salad and Laksa. The ‘Signature Dishe’ is Irish Whiskey Burger stuffed in Blue Cheese with a Guinness Cheese sauce burger for all who love that extra bit of cheese on their meat and potato wedges on the side. Kottu lovers will love their version of kottu – The Gourmet Seafood Kottu is filled with scallops, calamari, crab, prawn and mussels. This is different from the normal kottu and is Rs. /-. Something else to try out is the Nai Miris Lamb Chops, Pork Spare Ribs, Village Spiced Crab (Flaked crab meat curried and cushioned in a bread bowl served with traditional pol sambol), Flamingo Rice and more. The Flamingo House has a huge vegetarian line up as they found out in the past year there are so many people who turned to the ‘green’ side for many reasons.